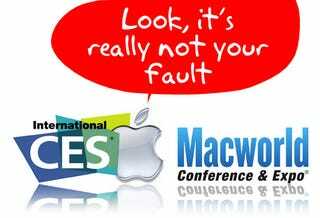 Is CES Still Trying To Seduce Apple? Apple announced this year that they would no longer attend the decade-old Macworld conference, leading some to speculate that the company would shift their focus to CES. Well, the CEA is now shifting their focus to Apple, but why? The floorplan for CES 2010 sees the iLounge—the section for Mac accessory retailers—expanded to six times its previous size. Why would they do this? Macworld, despite Apple's absence, is still happening, albeit one month later, so it's not like CES is addressing a trade show void. On the surface, it looks like the CEA might actually be trying to seduce Apple into attending their conference.